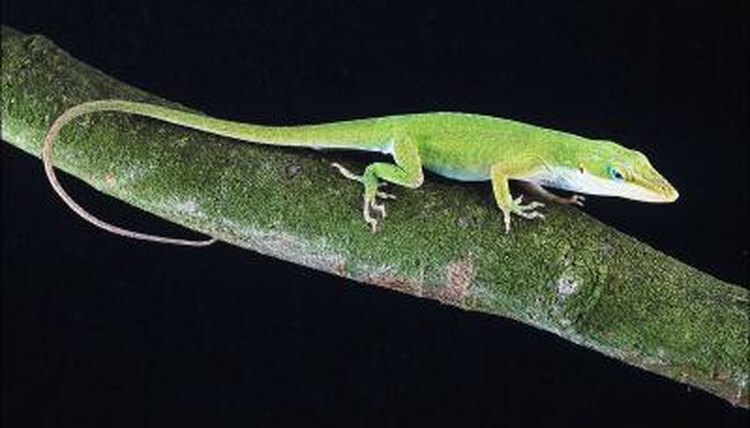 The green anole, also known as the Carolina anole (Anolis carolinensis) is a small lizard that is commonly kept as a pet. These reptiles are difficult to rear in captivity -- not because it is hard to get them to breed, but because it is not easy to keep hatchlings alive. Once the female lays the eggs, her parental role is complete. The baby anoles must survive on their own. Anole eggs are tiny, measuring an average of 6 millimeters in length and 14 millimeters in circumference. The shell is white and may be speckled in shades of brown. Females typically lay one egg at a time, though in rare instances they can lay a two egg clutch. When she is ready to lay her egg, she will find moist soil in which to nestle it until it hatches.